Cherry Bar Farewell AC/DC Lane Party – Saturday March 30th! 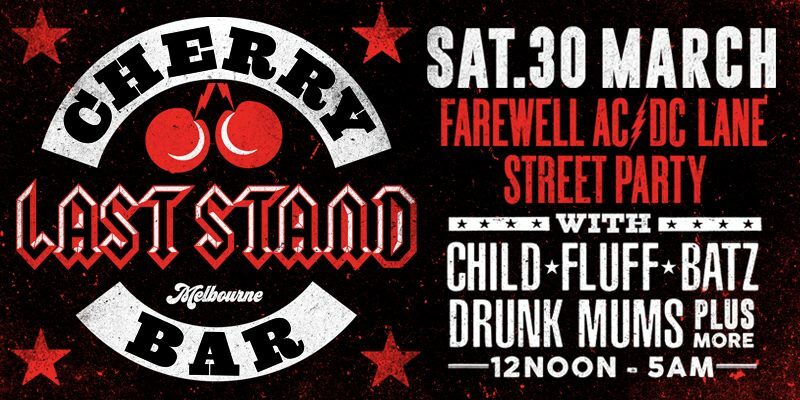 On Saturday the 30th of March Cherry Bar will trade for the last time in AC/DC Lane Melbourne, before moving to a new and as yet undisclosed location. Trust us, it’s going to be good! On the day and night we’ll have great local bands and Cherry stalwarts playing live inside Cherry. Bands like CHILD, FLUFF, BATZ, Drunk Mums and more! Cherry Bar Farewell AC/DC Lane Party - Saturday March 30th!